Exactly four years ago, Amar’e Stoudemire was soaking up the spotlight in Madison Square Garden. The star power forward, who had just inked a max 5-year, $100 million contract that summer, was dominating night in and night out. In the month of December, he averaged 29.8 points, 9.7 rebounds, and 2.7 blocks while setting the franchise records for most consecutive 30 point games (nine) and most consecutive games shooting 50% or above (also nine). Stoudemire went on to become the Knicks’ first starter in the All-Star game since Patrick Ewing and earned a spot on the All-NBA Second Team. Little did Stoudemire and the Knicks know what would lie ahead for the big man. Entering free agency in 2010, STAT was one of the most coveted players in the league. However, after years of dominating alongside Steve Nash in Phoenix, it became evident that Stoudemire would not be returning to the franchise. The Suns’ medical staff, management, and ownership determined Stoudemire’s surgically repaired knees were a major injury risk going forward, and as a result, they offered him a 4-year, $96 million with only $56 million guaranteed (way short of a max contract, especially with the non-guarantees). Steve Kerr, who was the Suns’ GM then, went on the record saying, “What I remember is our orthopedic surgeon Tom Carter saying that generally after six to eight years after a player has a microfracture there could be problems. We calculated he had a couple of good years left and that the back end of the contract could be a problem. Unfortunately, the Knicks and ex-coach Mike D’Antoni clearly didn’t get the message and failed to monitor the status of Stoudemire’s knees. Although Amar’e enjoyed an extremely successful first season as a Knick, D’Antoni rode him until the wheels fell off, playing him a career high 36.8 minutes per game. 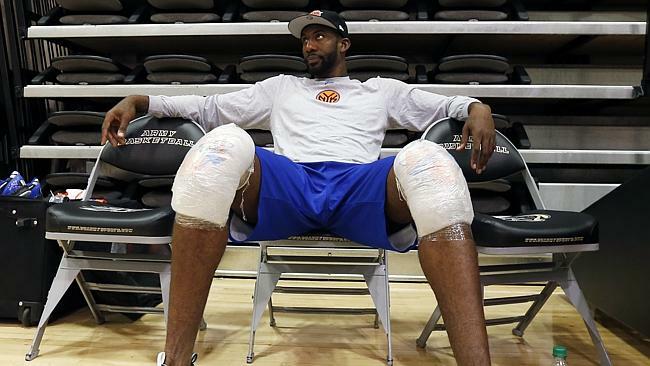 Two years and three knee surgeries later, Stoudemire was a shell of himself. Most people criticize Stoudemire’s game because of his inability to live up to his lucrative contract, but to judge him based on a dollar figure given to him when he was healthy just isn’t fair. You have to be willing to look past what he was in his prime and evaluate him as a 32-year old big man who’s undergone multiple knee surgeries. Only then is it possible to appreciate what he’s been able to do this year. Now in the last season of his massive deal, Stoudemire is showing signs of life. He was able to stay relatively healthy throughout the 2013-14 campaign thanks to heavy minutes restrictions, which set him up nicely for the current season: Amar’e is taking on a bigger workload (minutes are up to 25.3 from 22.6 last year), finding his groove, and providing a spark off the bench for a team that desperately needs help. Obviously, Amar’e is not the dominant scorer he used to be; the wear and tear on his knees has robbed him of the explosion that once made him one of the most feared scorers in the league. However, scoring 18.1 points per 36 minutes is no easy feat considering power forwards like Kevin Love, Paul Millsap, Zach Randolph, Serge Ibaka, and Tim Duncan are all failing to do so. Stoudemire is one of the only players on the Knicks to have benefitted from Phil Jackson’s triangle offense thus far this year. With zero post-scorers on the team outside of Carmelo Anthony, STAT’s being relied upon to create his own shot out of post-up situations as opposed to constantly getting his points through the pick and roll. Of course, Stoudemire still runs a fair share of pick and rolls, but only 44.6% of Stoudemire’s made field goals have been assisted this year, which is a career low, and he’s 15th in the league in elbow touches with 6.3 per game. With his new role on offense, Stoudemire has been impressive. He’s shooting 56.1% thanks to his ability to finish around the rim. More than half of his shots come from 0-3 feet from the hoop, and he’s converting 71.3% of these looks. The only time Amar’e has ever been this effective near the hoop was in the 2007-08 Season when Nash was spoon-feeding him dunks all year long. But the more shocking development in Stoudemire’s game comes on the other side of the ball. Throughout his career, it would have been generous to call Amar’e a subpar defender. I mean, we’re talking about a professional basketball player who claims he had “never been taught defense” until his 11th season in the NBA. Clearly, someone should have taught him defense a lot sooner because Amar’e is finally starting to show signs of being a decent rim protector, allowing opponents to only shoot 47.6% around the basket. For a frame of reference, this puts him up there with players like Robin Lopez (48.5%), Larry Sanders (49.3%), Marc Gasol (47.5%), and Josh Smith (47.3%). While he is still far from being an elite defender, Amar’e has definitely made strides in this area. Plus, he’s cleaning up the glass, grabbing the second most rebounds in his career per 36 minutes. As a result, Stoudemire is second on the Knicks with 1.5 win shares, trailing only Carmelo Anthony’s 1.7. No other player on the team even has a full win share thus far, which is a testament to how bad the Knicks, both individually and collectively, have been outside of Melo and STAT. Amar’e will finally shed the burden of being one of the most overpaid players in the NBA this upcoming offseason (well… if you can call earning $100 million a burden…). It will be interesting to see what happens to him. It’s possible he gets traded before the season ends, though I doubt it because his contract is so large; if he does, it will likely be to a team that just wants to use his contract to clear cap space for the offseason. The more likely outcome is that Amar’e stays with the Knicks for the remainder of the season and becomes a free agent. What he does from there is anyone’s guess. However, if Stoudemire doesn’t decide to take a discount for a contending team, I could very well see him back in the Big Apple on a much cheaper, short-term deal. He looks comfortable in the Knicks’ new system, and I have a hard time imagining that Amar’e wants to leave a city like New York. If he resigns, Stoudemire could redeem himself to Knicks fans. He’d no longer be judged by an enormous contract, but rather, he would be appreciated as a player who remains effective despite his age and injury history. Regardless, keep the wine bathes coming Amar’e! They’re clearly rejuvenating you!